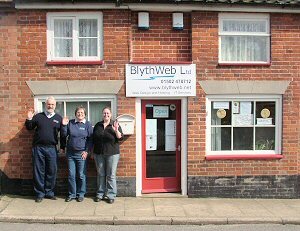 The April 2007 issue of the Wenhaston Word newsletter was the first to be published by Blythweb Ltd and the April 2012 issue was the last. Headed as 'Series 2', this monthly newsletter was A5 booklet format, stapled, and printed in colour with photographs. It began as basically 8–pages each issue, with an occasional larger issue, but grew to become a full 12–pages every month. Wenhaston Word was distributed to all residents in Wenhaston and Mells by dedicated volunteers but we know many printed copies found their way much further afield and was compared favourably against villages newsletters elsewhere. Worldwide it was downloaded from this website many hundreds of times every month. We endeavoured to feature articles and reports from village societies and organisations. These articles were included along with other items of interest, adverts for forthcoming events, as well as local business advertising, to produce what we hoped was an informative and entertaining publication. Production of the Wenhaston Word required considerable input of Blythweb equipment, staff, and their expertise, all of which we were willing to provide at no cost to the local community as advertising revenue mainly covered actual printing costs with Blythweb funding the shortfall. However, the front page of the April 2012 issue explains that we felt unable to continue with our voluntary efforts to produce a newsletter for our local community. -- Tim, Eileen and Becky. For the foreseeable future the 61 issues of Wenhaston Word that Blythweb Ltd published will remain available in our Word Archive on this website as their content may still be of interest and enjoyment. The Wenhaston Word was published by Blythweb Ltd from April 2007 to April 2012.